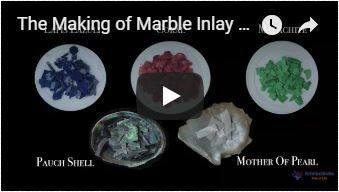 The semiprecious stones used to inlay in White Marble Antique Candle Holder are Carnelian, Lapislazuli, Malachite, Mother of Pearl and Turquoise. You can see that how beautifully the floral design is made on the marble antique candle holder with the semiprecious stones. The white marble inlay pen holder is translucent with the light. The marble inlay candle holder is made in Agra India & fully handmade. To maintain the marble candle holder simply clean it with soap & water & dry cotton cloth. The white marble candle holder will be delivered by Fedex or Dhl free of cost door to door.